If you’re looking for my usual “fast and easy” type recipe then you may not want to make these. They aren’t hard, but they’re more involved than what I normally post. I had to share them though because they’re so worth the extra effort! My husband and kids love them and the filling possibilities are endless. They’re kid-friendly and blow the store-bought frozen pocket sandwiches out of the water. There really is no comparison. The only problem with this recipe is that it doesn’t make enough. They’re always gone within 24 hours and I haven’t had the chance to freeze them for later. I hope you enjoy them as much as we have! Step 1: In large mixing bowl, dissolve yeast into warm water. Step 2: Add milk, sugar, shortening, egg, salt and 2 cups flour. Step 3: Slowly stir in remaining flour until soft dough forms. Step 4: Turn onto floured surface and knead 5 minutes. Step 5: Place dough in bowl and cover with tea towel. Let sit in a warm place to rise 30 minutes. Step 6: Punch dough down slightly. Divide into 16 pieces. Step 7: On lightly floured surface, roll out dough into 5 in. circles. Step 8: Place 1/2 cheese slice and 2 tbsp. ham on middle of dough. Step 10: Fold sides into the center and place pocket seam side down on greased baking sheet. Step 11: Cover and let rise in warm place 20 minutes. Step 12: Bake at 400 degrees for 10-12 minutes or until brown on top. In large mixing bowl, dissolve yeast into warm water. Add milk, sugar, shortening, egg, salt and 2 cups flour. Slowly stir in remaining flour until soft dough forms. Turn onto floured surface and knead 5 minutes. Place dough in bowl and cover with tea towel. Let sit in a warm place to rise 30 minutes. Punch dough down slightly. Divide into 16 pieces. On lightly floured surface, roll out dough into 5 in. circles. Place 1/2 cheese slice and 2 tbsp. 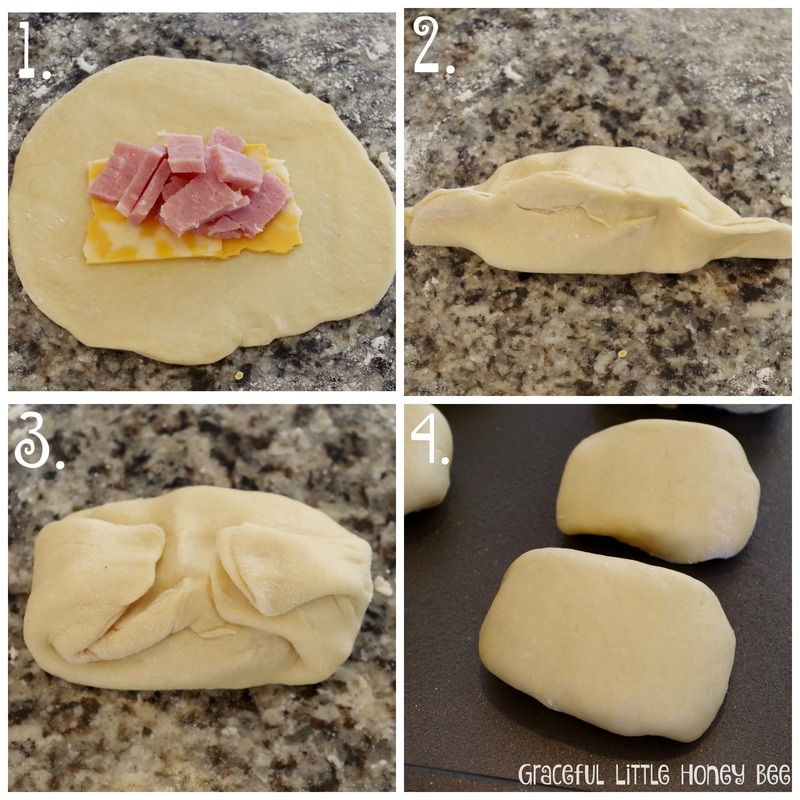 ham on middle of dough. Bring dough over the top of filling on both sides and pinch together. Fold sides into the center and place pocket seam side down on greased baking sheet. Cover and let rise in warm place 20 minutes. Bake at 400 degrees for 10-12 minutes or until brown on top. How would you freeze these and reheat? They look delicious, but no way would we eat all 16 soon enough! Oops! Guess I should have read a little bit better!!! I would freeze them in a gallon freezer bag and then reheat in the microwave one at a time for around 2 minutes or until warm throughout. These look delicious! Can I use something else in place of shortening? Would butter work as well? I believe you can substitute butter, but I haven't tried it. Thanks for letting me know! I'll have to try it out sometime. Are these good at room temp? I'm sure they would be fine. Have you tried making these with glutton free flour..? Absolutely amazing! 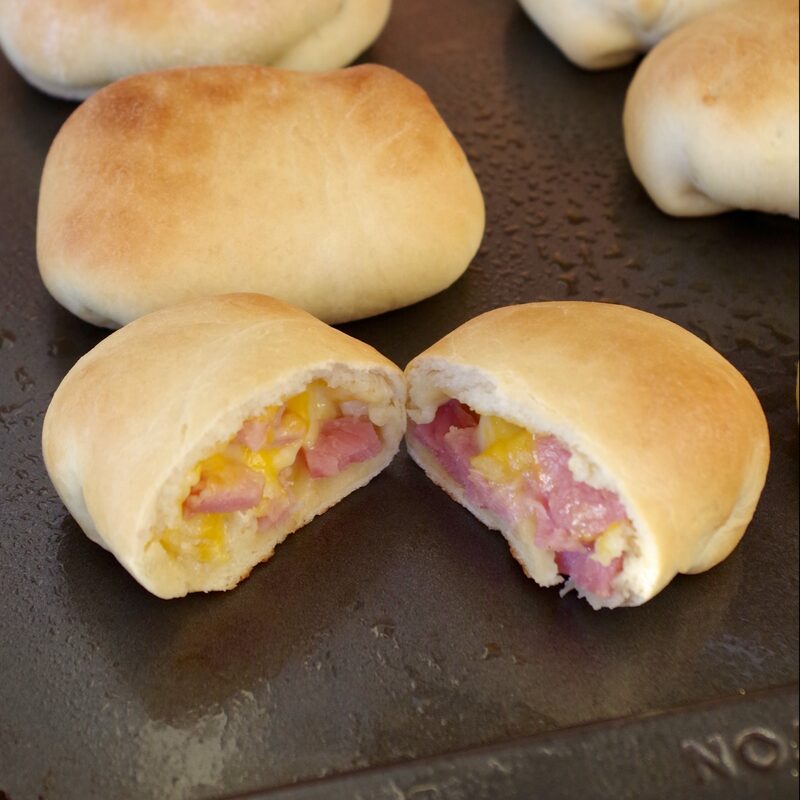 These are delicious and easy, even if they are a little time consuming. I can’t wait to try them with other fillings.